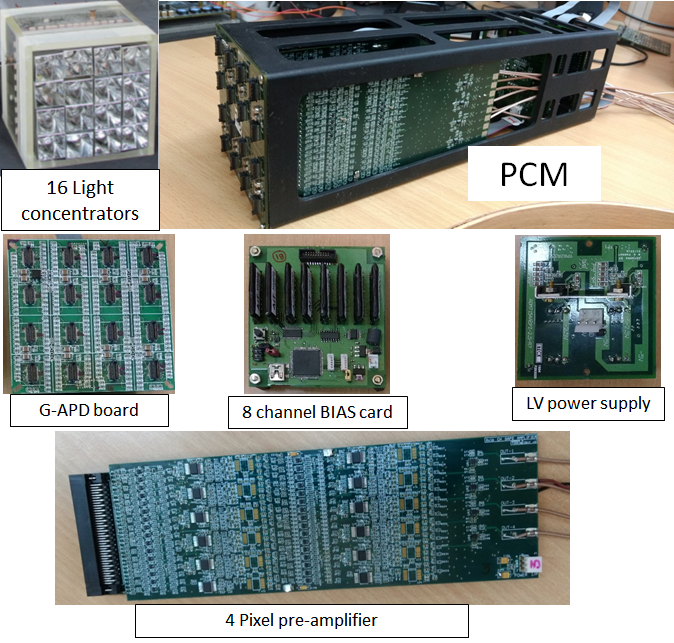 • A cluster of 16 Light concentrators and each concentrates light onto 4x4 array of G-APD ie pixel. • 16 pixel G-APDs are mounted on a G-APD board and board has two temperature sensors with 1W interface. • Two BIAS cards cater bias voltages to 16 pixels and designed over Micro-controller for control and monitoring. Each channel houses a DC-DC converter as bias supply with voltage of 0-80V and two variants are used vide commercial HV80 with 4mA load and in-house developed with 2.5mA load. BIAS board reads temperature from GAPD board sensors and tunes bias voltage against variation in temperature and load current. • Each sub-pixel G-APD in a pixel produces a current pulse, typically with a peak value of few microamperes and a rise time of 2-3ns. The preamplifier translates the pulses from all the 16 G-APDs in a pixel into voltage pulses, shortens them and finally forms a pixel signal by adding them. So, this pre-amplifier card signal conditioning of 64 sub-pixel channels maintaining good S/N ratio for single photoelectron detection sensitivity. 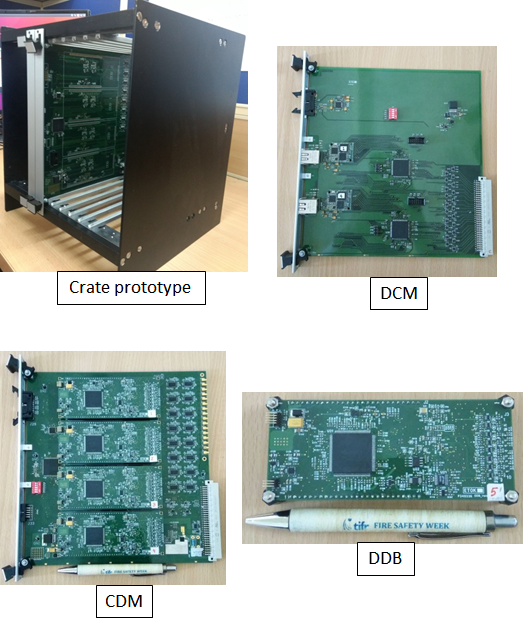 VME form factor Crate houses back-end processing modules vide 16 no.s of CDMs, one DCM and one CTM. The protype crate houses only 6 CDMs. • DRS based Digitizer Board (DDB) is designed using 9 channel analog sampler called Domino Ring Sampler(DRS) with 1000 cells in the ring, sampling rate @1GSPS. MAX 10 FPGA is used for interfacing DRS chip and ADC, pre-trigger generation, for event packet storage in FIFO, 80Mbps shared serial interface for data transfer, 20Mbps common serial link to crate back panel for event Marker readout and customized SPI interface to CDM processor for configuration. 9th channel is used for reference channel and calibration. It has a small form factor of 5cmx10cm size. • CDM houses four DDBs to process 16 pixel signals from front-end PCM. Each pixel signal is processed through low and high gain channels to accommodate 1-2000 p.e dynamic range. Each DDB processes 4 pixel signals. The FPGA in the CDM mother board coded for Full and Partial pre-trigger generation, four DDBs interfacing, interfacing to CTM, monitoring designed around NIOS soft processor. • Data Concentrator Module (DCM) pools data packets from 16 CDMs over dedicated 16 serial 80 Mbps links and pushes them to remote servers. • Control and Trigger Module (CTM) generates final trigger using the pre-triggers from all 16 CDMs. It has connectivity to remote PC over ethernet for operational control and monitoring.